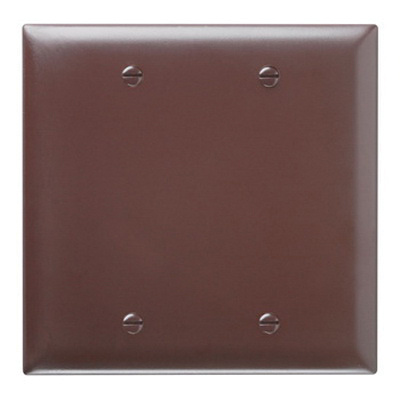 Pass & Seymour TradeMaster® 2-Gang Standard size blank wallplate in brown color, features rugged nylon construction with matte finish. Square wallplate measures 4.75-Inch x 4.6875-Inch x 0.070-Inch. It has pre-installed mounting screws. Box mountable wallplate is suitable for hospital, industrial, institutional and other high-abuse applications. It is UL94 V2 flammability rated to withstand harsh environmental conditions. Blank wallplate is cULus listed, CSA certified and RoHS compliant.